Photo: Paul Wellman De la Guerra Plaza. In no uncertain terms, farmers selling their wares at the Santa Barbara Certified Farmers’ Market delivered their message to the City Council. In equally no uncertain terms, members of the council got it: De la Guerra Plaza should not be considered an acceptable alternative site should the farmers’ market be forced to relocate from its current digs at the Cota Street parking lot so that a new police station can be built there. Individual farmers, representatives from the S.B. Certified Farmers’ Market Board of Directors, and market executive director Sam Edelman showed up en masse, arguing that De la Guerra Plaza is barely big enough to accommodate the market’s existing number of vendors, let alone new ones, and that there isn’t enough nearby parking. A newly reimagined and revitalized De la Guerra Plaza might be good for the City of Santa Barbara, the council heard, but the menu of broader uses designed to promote greater civic engagement ​— ​tables, chairs, a music stage, trees, landscaping, and ongoing programming ​— ​might not be compatible with the needs of the market. What would happen, one speaker asked, during Fiesta if the farmers’ market were moved to the city’s most historic plaza? How could the market coexist with El Mercado? Although the council voted to approve $200,000 for preliminary design, planning, and outreach for a major makeover to the plaza, councilmembers Eric Friedman and Kristen Sneddon made it clear they thought the council needed to take a much harder look at where the new police station will go. Friedman suggested Earl Warren Showgrounds ​— ​now struggling with crumbling infrastructure ​— ​might make a better receptor site. The old armory property was mentioned as well. In previous vetting exercises, city planners examined those sites and found them wanting. Photo: Paul WellmanSanta Barbara Certified Farmers’ Market manager Sam Edelman let City Council know De la Guerra Plaza doesn’t meet the farmers’ needs in terms of space or parking. 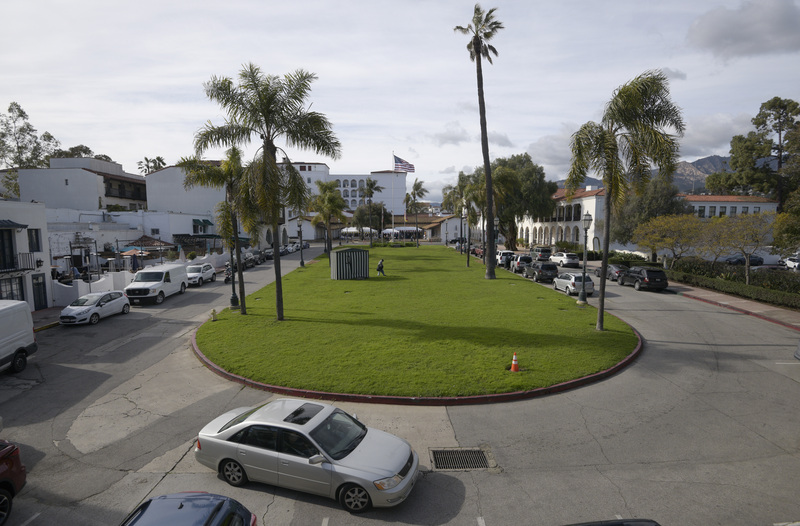 Before this Tuesday’s council meeting, it seemed a “done deal” that the new police station would go to the Cota lot and the farmers’ market would go to De la Guerra. Although that deal is hardly undone, Edelman said the market managed to buy some time. The market came in for some critical remarks along the way, too. Mayor Cathy Murillo complained about the torrent of emails “demonizing” the council. City Hall, she said, had generously provided city-owned space to the market for more than 30 years for $1 a year. Edelman noted later the market pays one percent of revenues to City Hall, which he said was considerably higher than $1. Councilmember Oscar Gutierrez noted that his family came to Santa Barbara in the 1960s to work the “farms and fields,” and expressed mixed feelings that none of the farmworkers involved with the farmers’ market were in the room. Not mentioned in Tuesday’s proceeding was the pivotal role nearby parking lots owned by the News-Press could play if they could be made available for the farmers’ market. If that was part of the mix, Edelman and other boardmembers stated, De la Guerra Plaza would be far more viable as a new location. But there’s longstanding friction between News-Press owners and City Hall. Edelman, who worked as a freelance photographer for the News-Press, expressed cautious optimism his connections with the daily paper might help.